More than 65 million visitors checked out career sites in June 2009. About 45% of HR professionals in the United States are using at least one social network to check on those leads. A summer 2009 survey for CareerBuilder.com conducted by New York based research firm, Harris Interactive, indicates that 47% of U.S. HR professionals use Google to search for the names of their job candidates. 29% of U.S. HR professionals use Facebook and only 26% use LinkedIn to check on the job applications that they receive. This is bad news for Linkedin because they claim to provide a service to benefit and advance their registered user’s career. This is all nice and great, but there are 2 obstacles that deter all of these objectives from becoming a reality: slow user growth and low number of minutes on site. Facebook is beating LinkedIn at its own game. 1. Facebook has more registered users than LinkedIn. While LinkedIn’s membership has continued to surge, reaching 53.6 million at the end of November 2009 from 31.5 million a year ago, it has been dwarfed by Facebook, which has surpassed 350 million members. This same trend can be observed on the monthly traffic of unique visitors to both social networks over the course of November 2008 to November 2009. 2. Facebook users spend more time on the site than LinkedIn users. According to a recent report from comScore, visitors spent about 13 minutes on average at LinkedIn during October 2009, while Facebook users logged about 213 minutes and MySpace users spent 87 minutes. Update March 2010: According to Compete, Facebook had a whopping 58.45 Pages/Visit vs. LinkedIn with just 16.42 in January 2010. While Facebook doesn’t explicitly target the career market, there are several companies, such as Ernst & Young and EMC Corp. and AT&T, that use Facebook to showcase their corporate culture and attract/recruit new candidates. 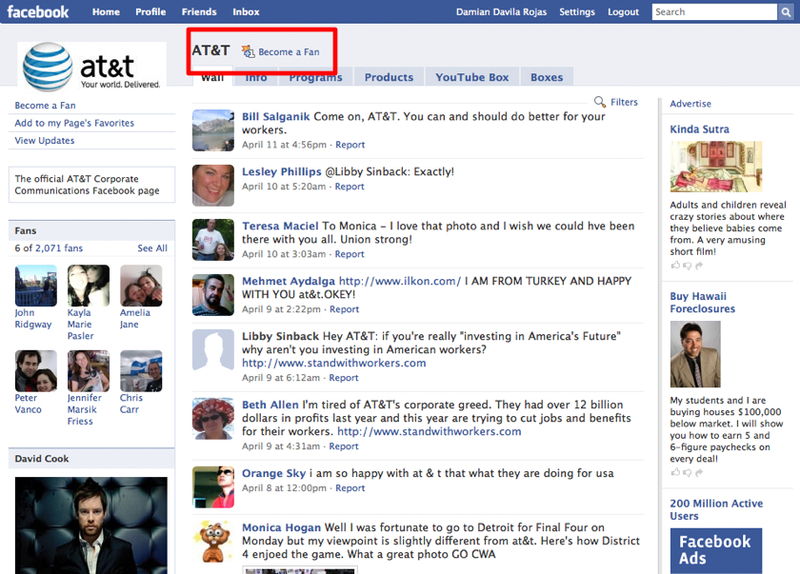 Below is a snapshot of the AT&T Facebook page as of April 15, 2009, when it had just 2,071 fans. As of January 4, 2010, the AT&T Facebook Page has over 179,000 fans. Using Facebook as a career empowering tool does make a lot of sense because of the large number of registered users and the higher amount of time these users spend on the site. However, LinkedIn shouldn’t just be worried about Facebook because there is plenty of competition from other websites that, unlike Facebook, specialize in the professional market. How can LinkedIn increase its number of registered users and the time that its registered users spend on site? That’s one great question for LinkedIn CEO Jeff Weiner. About the author: Since 2007 Damian Davila Rojas lives at Honolulu, Hawaii doing marketing, public relations, and web analytics. His research interests are viral marketing and how to use web metrics to make better strategic business decisions. Follow Damian on Twitter at @idaconcpts. I started twitter a few months ago, since then I’ve begun to love it. When I started I hated Twitter it’s allowed me to network with people in my life a lot easier. News and updates happen in quickly which makes for a great social communication app. Damian, I can’t make out whether you are pro or not toward LinkedIn. To be fair to your article should you not also have given detail of user ages and occupations? I for one would like to see a break down of the target market age groups on FB. Hi Nigel, thank you for your comment. I’m neither for or against LinkedIn by itself, but I am all for smarter ways to connect employers/recruiters with potential employees. From my research, it appears that Facebook has much more potential of achieving this than LinkedIn. I find it ironic/funny that you decided to use AT&T to make a point about how smart they are to use facebook to their advantage and attract new workers. On the screen-shot there are at least 4 comments that criticise AT&T, namely for they behaviour towards workers. I use linked in but not facebook. I find that linkedin offers discussions and the ability to join groups but there is a lack of social connectedness about the site. I think facebook definitely offers an informal setting so any serious activity is working off the popularity that it is primarily a social site. Some users don’t want their two lives to cross over in this way but there’s no fun going on at linked in at the moment. To me it’s just an online resume and a forum for the groups you’ve signed up to. Let’s see if they come up with something new soon (besides compatibility with Outlook). Great to hear from a reader from Brazil, I visited Rio back in 2004 and I had a blast. One of the best trips ever! As the number of fans continues to grow, I still think that AT&T is doing a good job at managing its Facebook Page. I do applaud that AT&T does not edit/delete the negative comments/feedback that it receives from its customers/workers. The whole point of social media is to have a 2 way conversation and listening to ALL feedback, BOTH good and bad. Giving a chance to customers/workers to publicly criticize AT&T it is indeed a good idea because it does show that the company cares. Recognizing a problem is the first step towards solving it. I agree 100% with you in that LinkedIn desperately needs more connectedness in its site. Common feature requests that I hear from colleagues are: 1) chat feature (similar to Facebook’s), and 2) project feature (similar to Pepsi’s Recycle project). Having these features would provide a better and more adequate incentive for real-time collaboration between LinkedIn users. 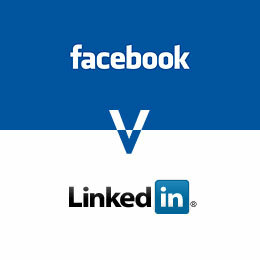 It’s unfortunate that Facebook is beating Linked In when it comes to a professional social network. Facebook should be a personal social media site and Linked In should be the premier professional social media site. I am not convinced that LinkedIn is as ineffectual as the author Damian claims. LinkedIn is not chatty and fun, it is no frills and functional. Facebook is a personal social media site, as @Zadling says. That’s where you go to retweet, post your Playfish game scores, and maybe get some cross-exposure for your hobby or other special interest group. And yeah, some companies have facebook pages, but why would a job candidate choose the AT&T facebook page BEFORE checking on the AT&T corporate careers site? Or CareerBuilder.com or Monster.com’s company background and job op page? And why are corporate HR depts relying so heavily on a site like FB, tilted toward personal information? Isn’t that a potential privacy conflict? Another difference is that LinkedIn seems primarily a way for individuals to network with other individuals. There are no company profile pages on LinkedIn. Similarly, one’s network on LinkedIn is not a popularity contest. Unless one is in sales or a very externally-oriented career field, it isn’t necessary to spend a large amount of time on LinkedIn, because most people don’t have hundreds of connections in their network. On Facebook, I believe the average number of friends is about 350, and can include all sorts of family, remote acquaintances etc. So yes, it makes sense to spend awhile logged on to FB for active users. Actually, the quoted 58 page/views per visit on FB is huge, for an average value. I don’t doubt it at all, as FB is a very big part of many people’s online social lives. But one shouldn’t need to spend that much time on a professional networking site like LinkedIn. I would like to see an age breakdown of active LinkedIn users, to compare with Facebook. I’d also like to say thank you for your March 2010 update article. I agree that Csreerbuilder, Monster, and yes even Craigslist (as you cited) are the true competition for LinkedIn. Please consider updating with Q22010 usage data, and include LinkedIn on the same graph as its competitors in the update chart? Thank for your feedback on this article. As you mention, LinkedIn is not chatty and fun, and the guys at LinkedIn are working real hard at changing that. The main challenge of LinkedIn is to overcome its lack of options for immediate communication. On Facebook you have chat options, sharing options, like buttons, comments on pictures, etc. On LinkedIn you just have forums and that’s pretty much it. I agree 100% with you that LinkedIn (just like Twitter) it is not a popularity contest. I believe that the key component of LinkedIn are the number of recommendations that you have and the key groups that have approved your membership (some groups have very, very demanding requirements). I will release soon another article on LinkedIn with updates stats. Thank you again for visiting idaconcpts.com!